The Ponytail Palm is really not a palm at all. It is a member of the Lilaceae (lily family), and is known as elephant's foot because of its bulbous base. It is native to the desert of Mexico and is somewhat of a curious feature/landscaping plant. A sturdy plant that can be used as a single specimen indoors or out, usually in containers 50cm or larger. 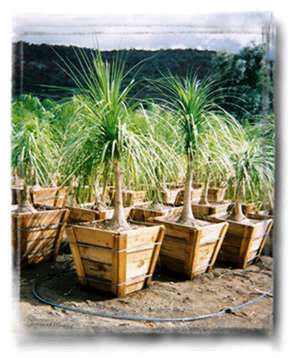 The ponytail palm stores its water in its base so it doesn�t require much water. Full sun to part shade. Outdoor plants need no extra care once established. For indoor pots: A sandy-mix soil generally minimizes the probability of root rot. Allow the soil to dry well between waterings, and if you have any doubt on whether or not to water the plant, skip it until the next week. Doesn't need much fertiliser. Fertilise in spring/summer with an organic fertiliser such as manure and/or a slow release balanced or low nitrogen fertiliser if necessary. Dry, brown foliage, a shriveled stem or desiccated roots are usually signs of underwatering. If you are overwatering, light new growth, stem rot or root rot will appear. Generally, the ponytail is insect free, but on occasion does attract mealy bugs, spider mites and scale. Take outdoors for a week and/or remove them by hand.